Pride in Politics will be having an author reading, panel discussion, and book signing of The People's Victory: Stories from the Front Lines in the Fight for Marriage Equality. This event will consist of an hour long reading and panel discussion of The People's Victory following a half an hour reception. At the reception you can buy the book and get it signed by the authors present. There will also be light refreshments. The authors below will be present at the panel and book signing. 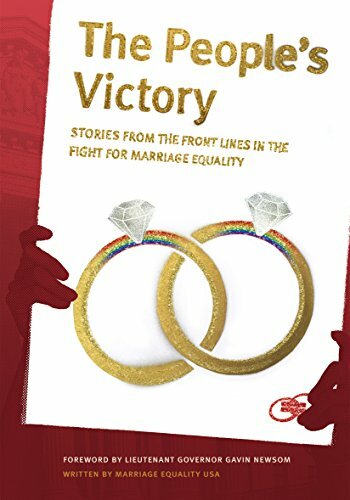 Book Description: "A stirring oral history told by those who almost inexplicably found themselves fighting on the front lines, The People's Victory recounts the successes – and the setbacks – that only served to strengthen everyone’s resolve to resist, fight, and bring equal marriage rights to an entire nation. Through it all, these love warriors found their voice and home in Marriage Equality USA, the nation’s oldest and largest grassroots organization of its kind. While high profile books, articles and documentaries have covered the judicial and legislative machinations, this book puts a human face on the people who made the everyday personal sacrifices to keep the movement alive." Want to order the book prior to the event? Click here for a FREE digital download for a limited time! You can also buy the book for a discounted rate at the event!